Fringe player on the outskirts of rock thanks mainly to his timing, as he came along just as rock was exploding and record companies seeking to capitalize on the perceived passing fad enlisted any musician reasonably suited for the role, particularly those without prior track records, in an attempt to jump on the trend and score some hits. Though Greer succeeded in that regard over time, his style was more rooted in the past and thus he remains more loosely connected to rock than a full-fledged card-carrying member of the fraternity. John Greer was born in Arkansas in 1923 and was a childhood friend of Henry Glover, a trumpeter whom he played with in the Alabama Collegians while students at Alabama A&M college. Glover’s career took off first when he joined popular bandleader Lucky Millinder’s outfit, not only playing trumpet but also writing charts. When King Records branched into black music they attempted to sign Millinder but since he was already under contract elsewhere he let some of his musicians make records under their own names for King, among them tenor sax player and singer Bull Moose Jackson. Joining Jackson at King was Henry Glover, who wrote much of his material and was hired as an A&R man/producer, one of the first black men to hold such a position in the record industry of the mid-1940’s. Glover would leave Millinder’s band to devote himself fully to his new duties with King, which expanded rapidly once Jackson’s record, “I Love You Yes I Do”, which Glover wrote and arranged, became a crossover smash just as rock ‘n’ roll was being born. But since it came out during that period before rock was established, and because it was a ballad with pop appeal, Jackson remained outside of rock, though he too left Millinder and formed his own band on the strength of that hit and many more to follow in the same light ballad realm, with a few off-color sly mid-tempo songs thrown in that led to his most lasting notoriety in many quarters. 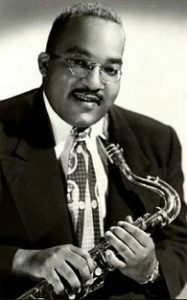 Millinder needed a replacement for Jackson in the horn section and called on Glover for suggestions who brought him his old pal John Greer, who even looked like Bull Moose to a degree, played the same instrument and also sang in a mild tone that belied his ethnicity. A year later, as the 1948 recording ban was nearing its end, Greer was offered an opportunity to cut records on his own while remaining with Millinder’s band and did so, hoping to have the same success as Jackson had. The difference was in the year since Bull Moose broke through, rock ‘n’ roll had arrived en force and that was what the label had in mind for Greer’s direction. They slapped the Big John Greer name on him, and titled his first instrumental “Rockin’ With Big John” so as to drive home the point and leave no doubt what field Greer was aiming for. Though it didn’t catch on, they continued undeterred and he proved himself a capable performer in this realm, though like Jackson was usually more at home in slightly more sedate settings. Maybe not surprisingly his biggest hit, “Got You On My Mind”, wasn’t a storming track by any means but rather a grooving ballad that straddled the fence between genres. Greer continued playing with Millinder, as well as backing others in the studio in between his own sessions, but developed a growing dependency on alcohol which curtailed his career by the late 1950’s. As with his predecessor Bull Moose Jackson, both men were probably not fully suited to rock music in style or temperament, yet the difference was Jackson’s pre-rock success kept him outside of the field, even as he was close to it in many ways, whereas Greer’s later start in the midst of the first rock mania meant he’d always be aligned with rock ‘n’ roll. Greer died in 1972 at the young age of 48.